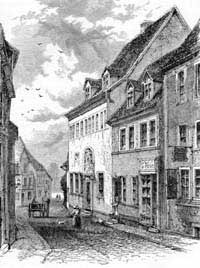 In the beginning there was Cassel (now Kassel) the central German city in Hesse some 180 kilometres north of Frankfurt, where in the 14th century the first Cassel manns were officially registered. Parts of the German region of Thuringen had belonged to Cassel's rulers since 1247. Very early in history-the city's walls were still not completed-restless residents of Cassel moved away, at first to small towns and villages nearby, and later they moved farther away. Wherever they went, they were called "men from Cassel" and spelled their names Casselmann, Cahselmann, Cassilmann, Kasselmann, Kaselmann, Caselmann, etc. (according to Brechenmacher's dictionary of German names). Brechenmacher mentioned Andreas Casselmann, registered in Simmershausen near Cassel in 1418. In an official document from the town council of Witzenhausen dated September 19, 1367, the name Casselman is mentioned in connection with a transfer of payments to the near monastery Germerode. 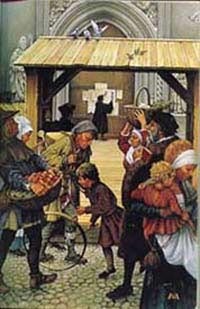 Many people from Cassel emigrated to Grossalmerode some 22 kilometres east of Cassel, where they were first mentioned in 1639 in a list of men to serve in the army of the aristocrat ruling in Cassel (Jost Casselmann). However, Casselmanns probably lived in Grossalmerode even earlier than that. At the end of the 17th century, Casselmanns in Grossalmerode were so numerous that the people could only keep them apart by giving them nicknames. Their professions: shoemakers, potters, prize-winning butchers, teachers, mayors, and city officers. The Pennsylvanian hero in the War of Independence, Heinrich Casselmann, was a shoemaker before he came to North America. It is proven that he did not come from Adelshofen; maybe he was born in Grossalmerode. Potters from Grossalmerode taught their profession in Reinhardswald, a forest region northeast of Cassel, for example, Johann Friedrich Casselmann (Udenhausen-exhibition catalogue "Pottery from Reinhardswald," Kassel 1982, page 189). Earlier Heinrich Casselmann was mentioned as a potter from Grossalmerode. It is interesting to see that Casselmanns from Grossalmerode knew how to preserve their right of residence in Cassel-it is explicitly mentioned. Among the Hesse soldiers sold to the Britains to fight in North America, there were Casselmanns from Grossalmerode and other Hesse towns. Even today, most Casselmanns live in Grossalmerode. The ancestors of almost every second Casselmann living in West Germany were born in Grossalmerode. In the 200 years from the middle of the 17th to the middle of the 19th century, many Casselmanns also lived in Allendorf along the River Werra. They were craftsmen, teachers, but mostly fishermen and boatmen. Later they moved downriver to Rinteln and Vloto. One of them, by the way, Philipp Casselmann, took the juridical doctor's degree at the University of Jena in 1706. The Casselmanns from Rinteln have most prominent family members in their ranks. Wilhelm Theodor Casselmann, who lived from 1820 to 1872, studied chemistry in Marburg, where he was one of Bunsen's scholars. He took his doctor's degree, taught at the Marburg. University, and became deputy principal of the Wiesbaden High School. He also taught young soldiers at the Nassau Military Academy and belonged to numerous official examination committees. He wrote schoolbooks for high school chemistry classes and analyzed the healing waters from Bad Soden and Neuenhain in the Taunus region in southern Hesse. For many years, he was an elected member of the upper house of the Nassau parliament, another sign of the respect paid to him. Eva Maria Zilling, nee Klincksieck, Hamburg, is a niece of Leopold von Casselmann. Her paternal grandmother was a nee Casselmann from Rinteln. Mrs. Zilling descends from an old established family of booksellers and publishers, living in Paris in the fourth generation. As a young woman, she studied history of art in Halle and established close contacts to the famous Bauhaus. Today, Mrs. Zilling is 88 years old and still residing in Hamburg. The respected German daily newspaper Die Welt on December 7, 1976, ranked her among the ten "grand old ladies" of Hamburg, along with famous German artists and actresses such as Ida Ehre. In the south of Cassel, Casselmanns live in Melsungen, Lispenhausen, Gensungen, and Felsberg. I cannot go into details; it would take too long. But there is one more Casselmann I must mention because he presented us with a family colour-Casselmann green. He is Arthur Casselmann. He was born in Felsberg near Cassel on September 3, 1828, and died in St. Petersburg, Russia, on November 10, 1872. He was a student of Friedrich Wohler, a worldfamous chemist. In 1865, he received a call to St. Petersburg, where he worked as the secretary of the Russian Pharmaceutical Association. He founded a Russian magazine for pharmacy. He discovered Casselmann's green, a colour also widely known in Germany as "Schweinflarter green." Today Casselmann's or Schweinfurter green is not used any more. Even centuries ago, Casselmanns with an academic degree moved far away. Around 1600 they lived in the Magdeburg region. In 1603 Constantin Casselmann from Magdeburg took a master's degree at the University of Jena. The Jesuit priest Heinrich Casselmann from Rheinbergen near Cologne came to Erfurt sometime around 1700, where he was Placidus, abbot of Erfurt, and for several years president of the city's famous university. Last but not least, there are the Casselmanns from Adelshofen, who in 1709 left Germany for North America. There they became the largest of all family branches. How they came to Adelshofen is still a mystery. However, Casselmanns not only emigrated to North America, and Arthur Casselmann was not the only one to go to Russia. Some of those emigrants probably came back to Germany during World War 11. The Casselmann family in Switzerland is closely related to Heinrich Casselmann from Grossalmerode and his descendants. It is interesting that even Hans-Dietrich Casselmann married a Swiss woman-Anna Rinder from Glattfelden, Zurich. Eva Maria Zilling's parents and grandparents in Paris owned a respected bookstore and a publisher's house called Klincksieck. One of Germany's most famous publishers, Rowohlt, learned his trade in this company. Also in Paris a sister of Juergen Casselmann lives with her children. In Belgium there is a Casselmann family too. They are Flemish and Catholic. I could not obtain more information about them because my correspondent was stopped writing without giving reasons. It is not easy to establish who is related to whom in this large family. Jane Casselman from Detroit has a theory that may be helpful: "Look at the nose," she says, and indeed, John, Dan, Ed, and I have the same noses. Very well, then. For the time being, it is enough to know that we all have the same name, that we are Germans or that we were Germans at one time. There is a lot to do; let's get on with it.